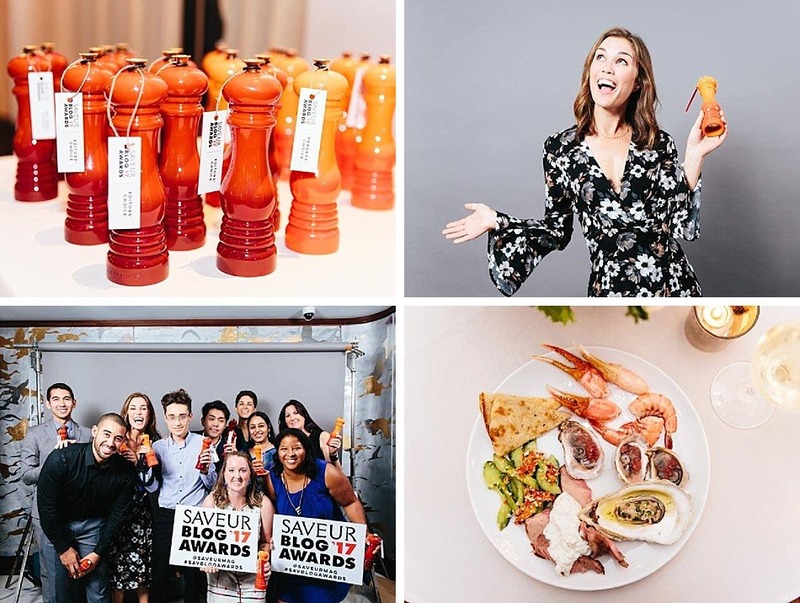 Pinot Ritas and the Saveur Blog Awards! Break out your glassware and some bar snacks because it’s time for show and tell! 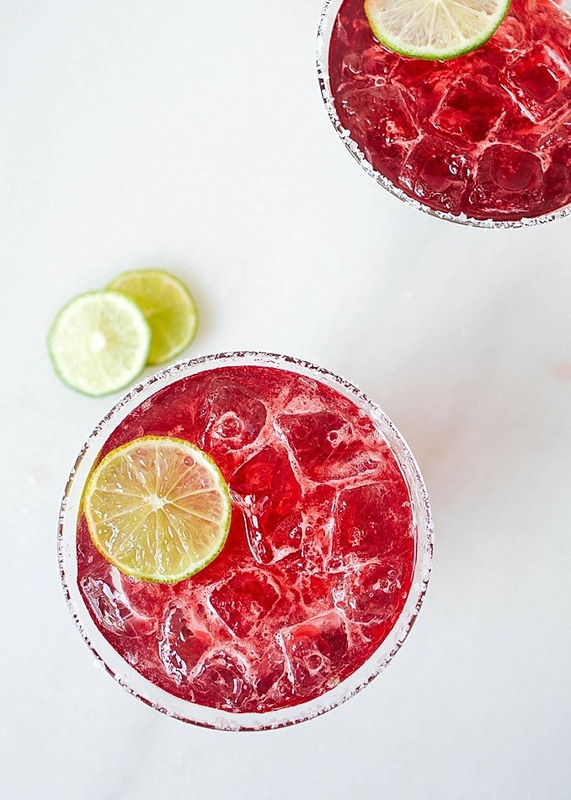 Today I’m spilling the details of my recent trip to Charleston, SC for the Saveur Blog Awards , and we’re going to talk the ins and outs of these boozy pinot ritas! If you’re curious and thirsty, you most definitely came to the right place! 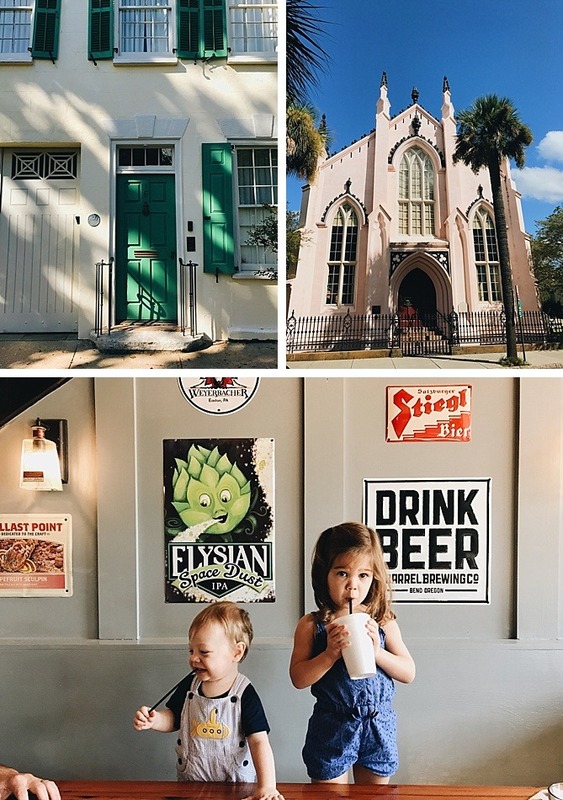 In place of the luxury accommodations we usually opt for, we selected an Airbnb on King Street that boasted quick access to restaurants, coffee shops, and (let’s be honest) Jeni’s Ice Cream. 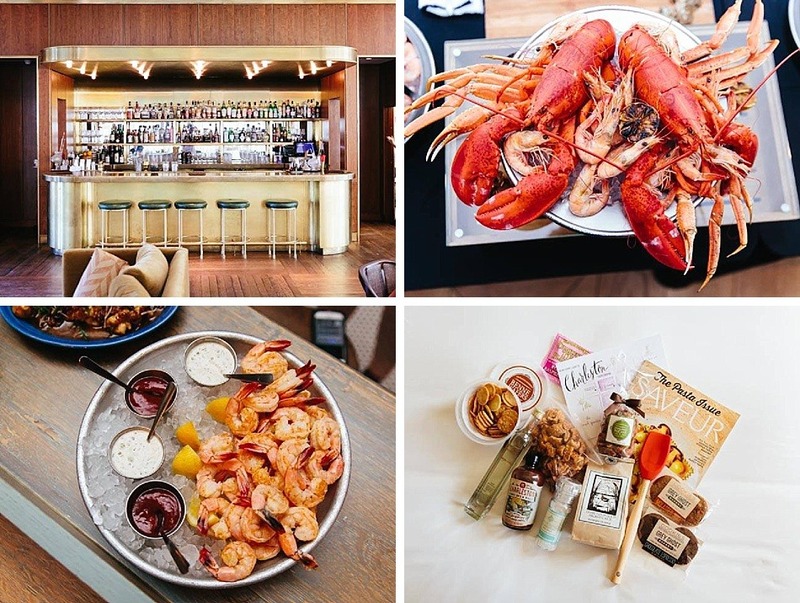 The Saveur events didn’t start until Sunday, so we spent just over 24 hours in the city as a family. 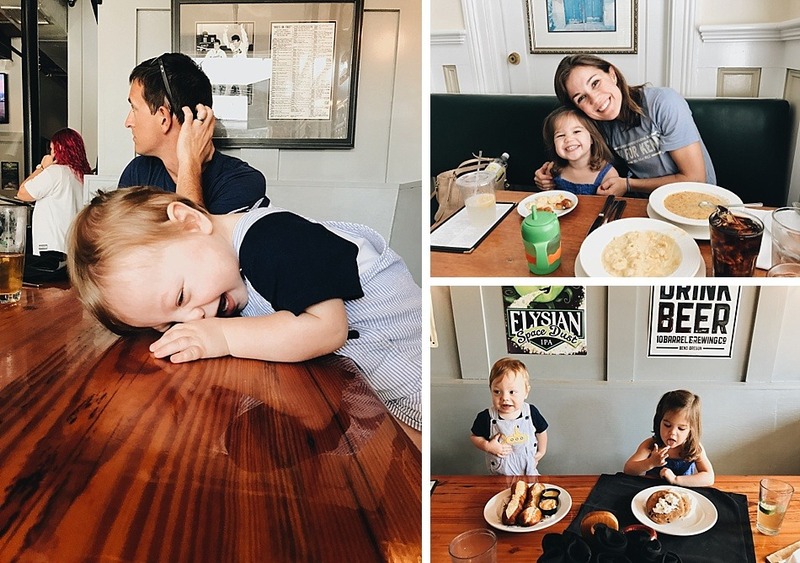 It’s fun to watch your kids explore new places, and at 3 and 1, Aimee and George found a bit of adventure everywhere we went. Living room chairs and tables were new jungle gyms. Sidewalks were their ultimate playground for jumping, dancing, and crawling. Friends, I learned last weekend that my kids, given enough patience and nap time and ice cream, are willing and able to travel. While the trip was not without a few hiccups or emergency diaper changes, I think we really have a shot at a future of family traveling. TBD. Once the blog awards crew arrived, the weekend really amped up. I was thrilled to see my dear friend Erin for a second time, and I even got to meet my long-time interwebs lady friend, Rebecca. These two, along with the multitude of other beautiful faces I met throughout the weekend, filled the days with laughter and served as excellent sources of encouragement and relation. 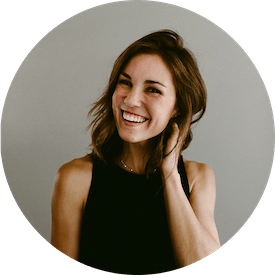 Sometimes, as a blogger, you start to feel a little like an island, and it was so reassuring to hear from friends who are in the thick too. The kind folks at Saveur set up a fabulous weekend of events for the finalists, including tours of Charleston, cocktail parties, pub crawls, and even panel discussions where we got to hear from industry experts about the ins and out of marketing, brand management, publishing, and social issues within the food industry. Yes, I met Deb, the fairy Godmother of blogging, and yes, she is as delightful and charming and sincere as you might have gathered from her writing. We heard from a number of other authors and even a few Southern entrepreneurs like Carrie Morey and Brooks Reitz. My biggest surprise of the weekend was how kind everyone was! 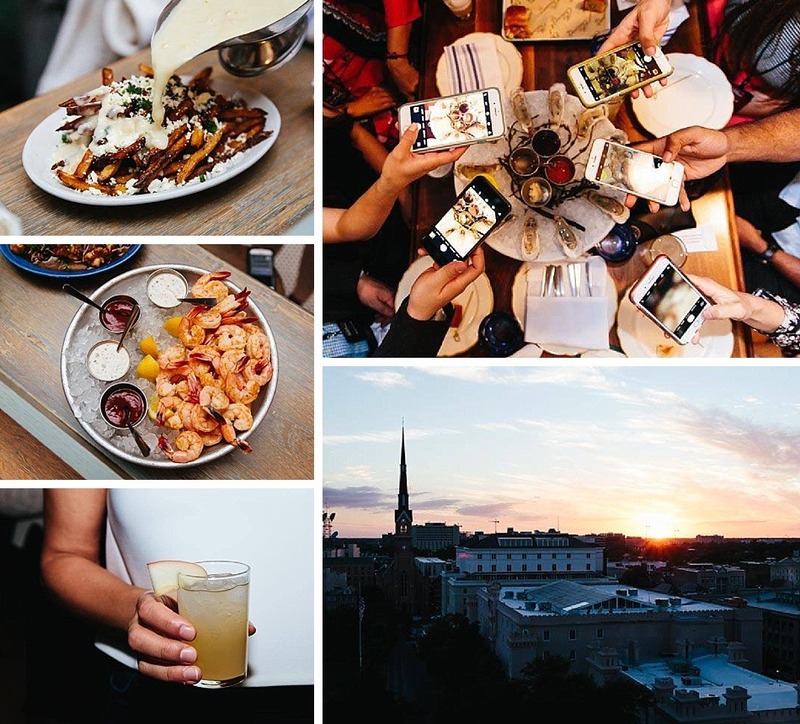 Sure, we were all on our best behavior for the weekend, but I was still shocked at how quickly I grew to like so many of the other bloggers and Saveur staff members. It kinda felt like a weekend of summer camp, except there was a ton of booze, the food was great, and no one woke up covered in shaving cream or sunblock. Basically, it was just really rewarding to share in the excitement with a lot of like-minded people, and that was probably the best part of the whole trip. 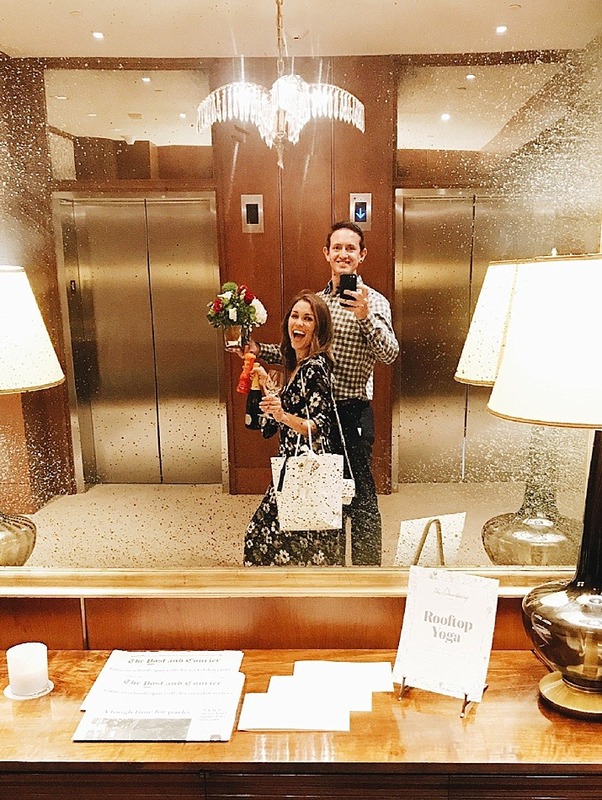 Just a lobby selfie of Brett and I after the awards. Very age appropriate, right? 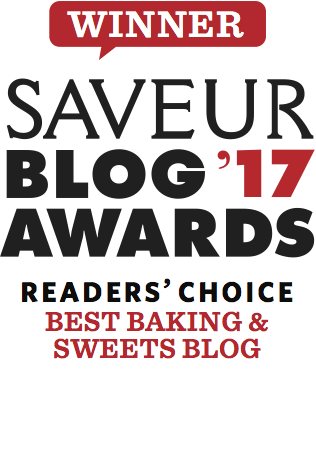 I was honored to bring home the Reader’s Choice Award in the Best Baking and Sweets category. Although I attribute the win, in large, to the votes of my husband and my crazy-dedicated Selma friends, I am also aware that much of the success of this baby blog has been due to the help, encouragement, and inspiration that I’ve received from other blogger friends like Erin and Rebecca. It’s kinda like that scene from “Mean Girls” where Katy Herron breaks her homecoming crown into pieces and throws bits of it to other girls in the crowd; any win I experience in this new “career” is shared with the beautiful friends who have sewn into this site. It’s a thrill to bring home a trophy, but the joy comes with the people who earned it with me. I will forever pinch myself with delight that I get to do something I love so much and that other people, like you readers, want to be a part of it. So thanks. Y’all are the best. Alright, now let’s talk about these pinot ritas. This recipe was inspired by a cocktail we enjoyed on our recent trip to Portland. Leading up to the awards weekend, we were promoted by Savuer to create a seasonal cocktail recipe using tequila. The winning cocktails were shared at the opening ceremony night, and although my cocktail didn’t win, I couldn’t stand to not share the recipe with you all. 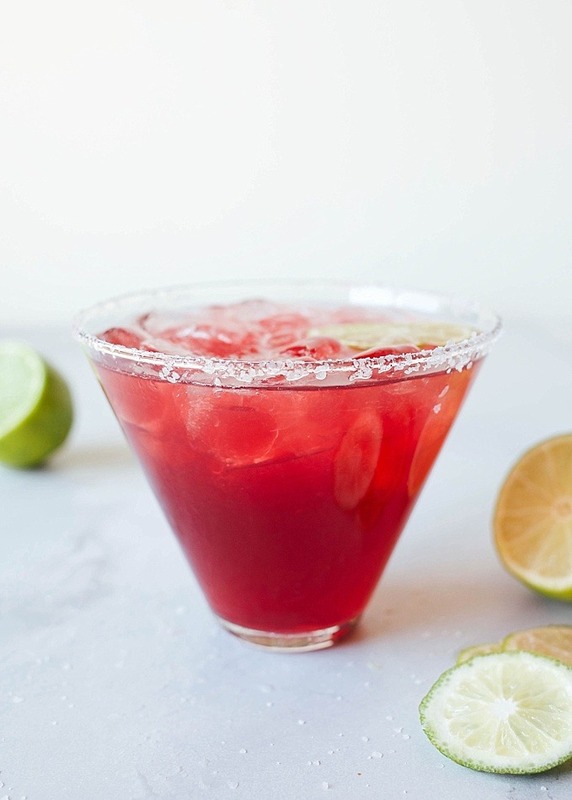 Made with a pinot noir simple syrup and classic margarita ingredients, these pinot ritas are sweet, tart, and boozy in all the right places. You need them. So let’s learn how to make ’em. We start by preparing the pinot noir reduction. Simply cook down the red wine with a bit of sugar until it becomes thick and syrupy. You can prep this in advance and store it in the fridge for up to two weeks. Once the reduction has cooled, the preparation of the pinot ritas is rather like making a classic margarita. Add some tequila, orange liquor, lime juice, and the pinot noir syrup to a cocktail shaker filled with ice. Shake, shake, and shake some more until the whole thing is iced down and well combined. Pour the contents of the shaker into a salt-rimmed glass and garnish it with a lime wedge. 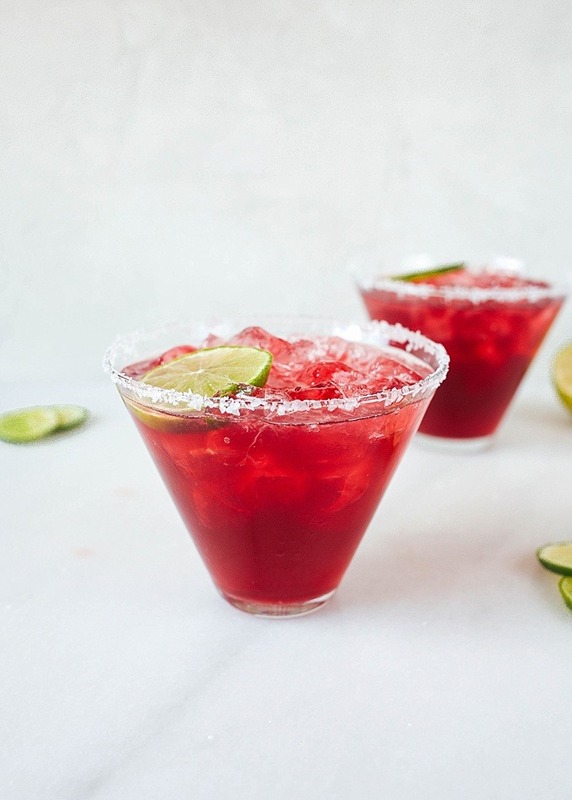 Easy as pie, these pinot ritas are a simple, surefire way into the hearts of both wine enthusiasts and tequila lovers. Everybody wins. 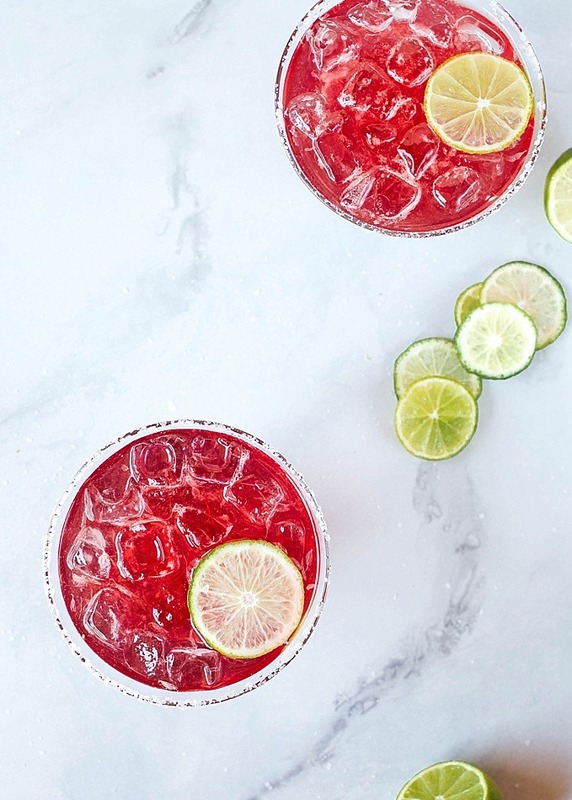 So whip up a glass (or four) of these pinot ritas to start your week off on the right foot. These boozy treats are perfect for the fall and are a must-make in the weekends ahead. Give them a try and let me know what you think! Thank you again for all of your votes, support, and enthusiasm for baking and sweets. You guys make this worthwhile and I couldn’t ask for any more than what you’ve given me. Cheers to you! 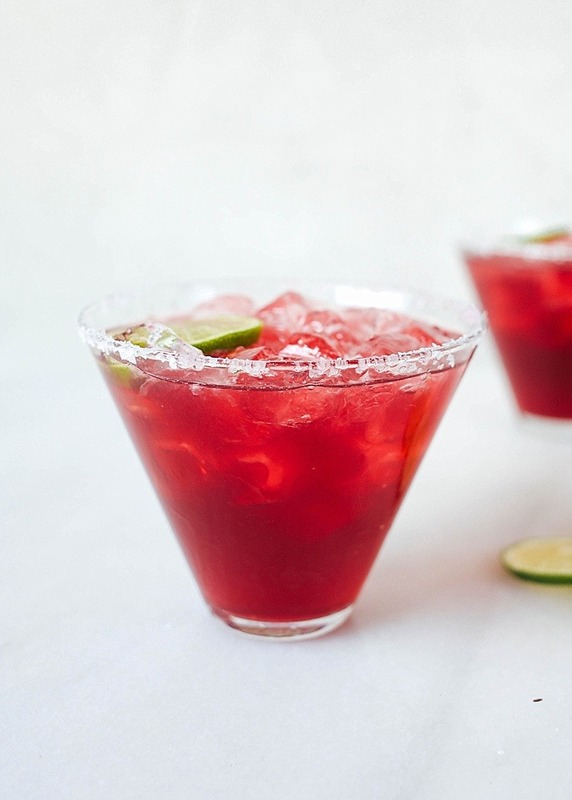 Made with a pinot noir simple syrup, these pinot ritas a sweet and tart, wine-flavored take on the classic margarita. Make one or batch it for a crowd! Stir the pinot noir and sugar in a small saucepan set over medium heat. Bring to a boil and continue to cook until the contents of the pan have been reduced to 4 ounces, about 15 minutes. Allow to cool and chill completely in a heat-proof container in the fridge. The syrup will make about 4 Pinot Ritas. Salt the rim of your glass, if desired. Combine the tequila, lime juice, pinot noir syrup, and Cointreau in a cocktail shaker. Fill the shaker with ice and shake vigorously for about 30 seconds. Pour the entire contents of the shaker into the prepared glass. Serve with a lime wedge, if desired. I was going to comment on this but it was literally 30 seconds after you posted, which I thought might come across as creepy, so I was going to come back and do it! Annnnnd then I forgot. I had the bestest ever time with you and Becky, and couldn’t be more happy that you totally KILLED IT. you were a highlight. loved seeing y’all.